Tiny sneak peek into my everyday campus life. "Every year, I get half as pretty and twice as drunk!!" This is from left to right: my roommate Pachi, Byoru, Sunhyung and Inhyung from Korea and myself. From the new people who arrived these three are the only ones we really really like. Some Italians are okay too but we are not really fond of the other ones. 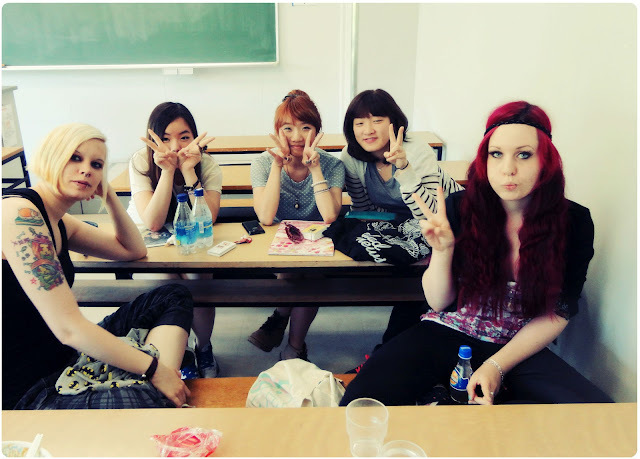 It's sad since the people who were in Japan until February were kinda our soulmates, we all were a big big family! Guess that's also a reason why I'm more homesick more.. all the good people are gone U_U" Here we have lunch break without lunch and waiting for the third lesson to begin. The "seats" are extremely uncomfortable and I mostly end up sitting against the wall because my back hurts after 8 hours on these wooden benches. Afterwards we headed right to Ebina, a small town next to where we live. They have the biggest + closest cinema there which was the reason we went! 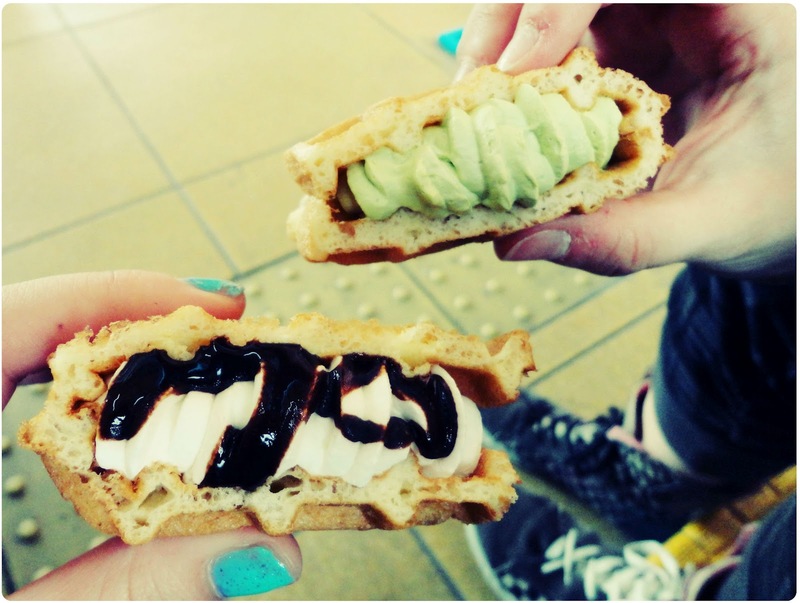 Before watching "Dark Shadows" we ate waffles and looked around since it was our very first time in Ebina. Except the cinema there's not really anything there so no pity that we never went there before! (^ . -) The film itself was really funny, we enjoyed it a lot! A lot of playing of words though, which couldn't be translated into Japanese subtitles, so we ended up the only ones laughing mostly. I totally enjoyed Johnny Depp's charakter, cannot believe he's kinda the same age like my father O__O" If you like Johnny Depp in his more crazy roles or Tim Burton or both, go and see the film! Though it's not exactly a film you have to go to the cinema for I'd say. I just went because Pachi was insisting for a month now to go. 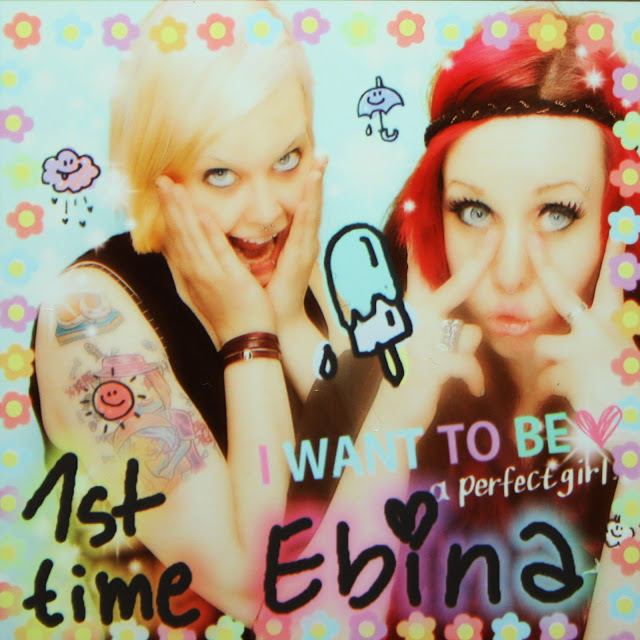 Here you go with some purikura we took in Ebina before the movie startet! I'm sorry for the bad quality, I don't own a smartphone therefore I can't get the pics on the computer and have to take pics with my camera :/ The smaller the pictures on the sheet the more crappy my computer version, I'm sorry >__<"
I've honestly no idea what the machine did to my face, especially eyes, but I do look pretty awkward o.O"
We don't take purikura seriously, we mostly end up doing some stupid things or end up having weird pictures.... which we love! There are also some I can never ever show anyone! 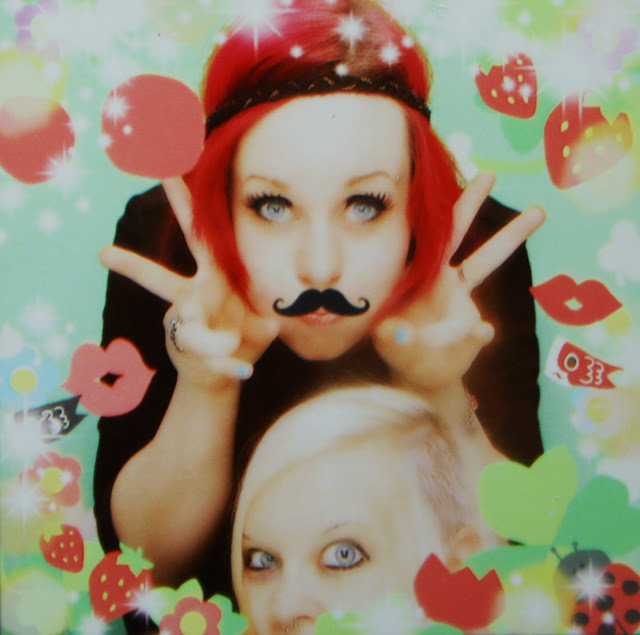 XD This was actually the 80th purikura sheet we took since we are in Japan, close to our goal!!! 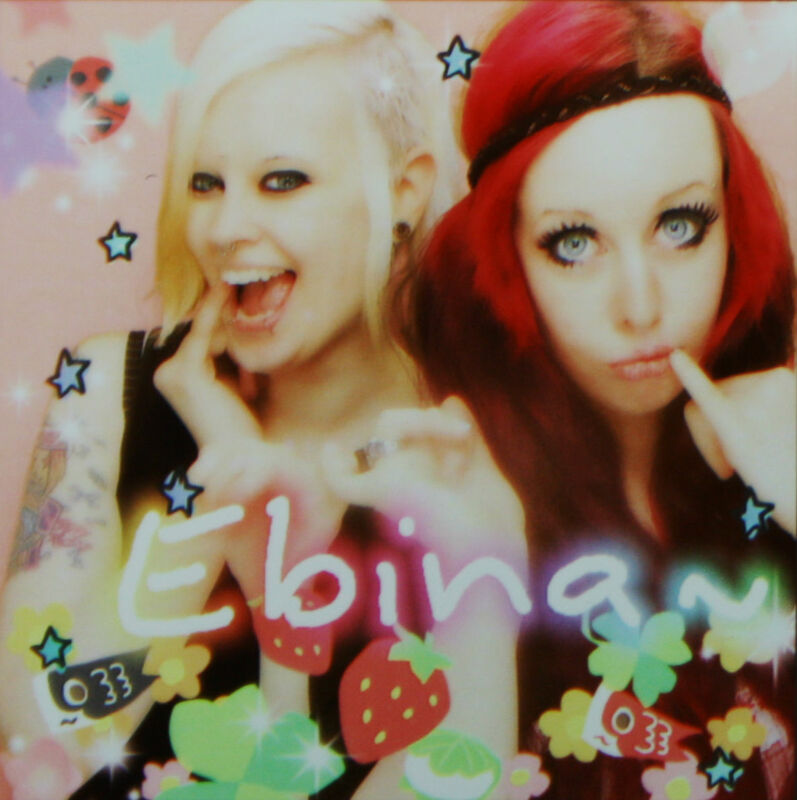 Shortly after we arrived in Japan we made a promise to ourselves that we will make 100 sheets of purikura. Honestly, we could have barely reached the goal without Susann who was here in March and with whom we took 20 sheets in less than 2 weeks :D OMG, in the end we'll spend 400$ just on these tiny little glitter stickers but.... I tell you guys. This is more worth than any other souvenir I could take from here. Some people buy stuff or store Japanese goods. I take purikura, always, with everybody I like. It's just something I cannot stop with. 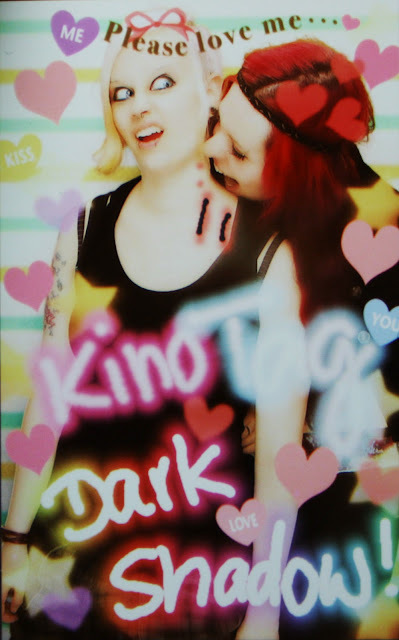 And I made so many nice experiences, like, when we're doing some cosplay and random Japanese people ask us to join them because they find us cute and other stories. It really is hilarious and I FREAKING LOVE IT. Word.